Jeff Koons artworks at Chicago's Advocate Hope Children’s Hospital. RxArt, the non-profit organization that curates contemporary art installations in hospital settings, and Kiehl’s Since 1851, the venerable New York-based purveyor of fine quality skin and hair care, have partnered to bring the artwork of Jeff Koons to Chicago’'s Advocate Hope Children’s Hospital. 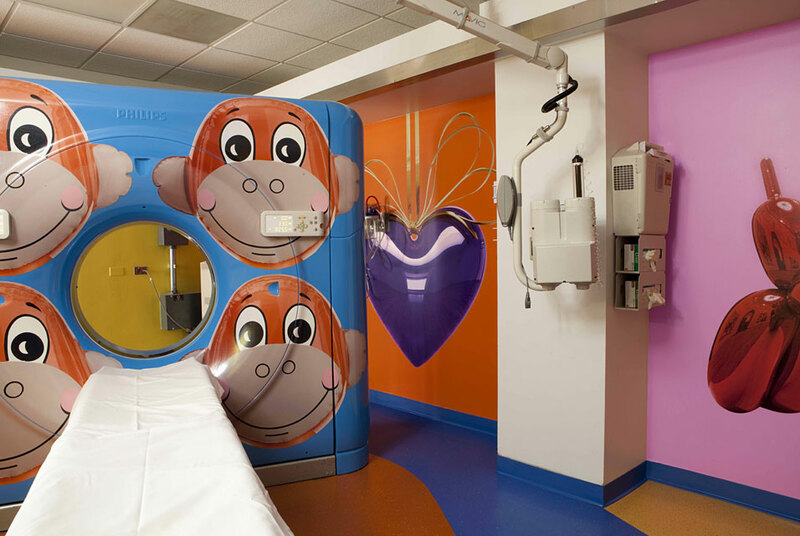 Kiehl’s underwrote the fabrication and installation of works by world-renowned pop artist Jeff Koons on a CT Scanner and throughout the scanner room at Advocate Hope Children’s Hospital for RxArt. As a result of this project, Koons’ iconic characters will find a permanent home in the hospital’s radiology department, to soothe and cheer young patients and brighten the typically sterile and potentially scary testing environment. To create the installation the CT Scanner was disassembled and painted, and decals featuring Koons’ Monkeys were applied to the machine. His iconic Balloon Dog, Hanging Heart, and Donkey imagery were also installed to brighten the room as wallscapes. Koons generously donated his artwork and took no fee for his participation in this project. RxArt is a non-profit organization that commissions fine works of contemporary art in hospitals in the United States. The organization came to Advocate Hope Children’s Hospital at the urging of Richard E. Heller, III, M.D., the hospital’s Chief of Pediatric Radiology. A father and contemporary art collector, Dr. Heller learned of RxArt’s programs, and contacted the organization to see if they could initiate a project for his patients. Kiehl’s has supported RxArt since the organization’s inception, and in 2009, donated approximately $80,000 to the organization through a number of initiatives. For the 2009 holiday season, Kiehl’s raised both funds and awareness for the organization through a Limited Edition Creme de Corps Holiday Collection, from which 100% of the net profits were donated to RxArt. The labels on the Limited Edition bottles were designed by New York-based, internationally renowned artist, KAWS. To further support the organization, Kiehl’s also created a crayon set – also designed by KAWS – that was sold to accompany RxArt’s annual “Between the Lines” fund-raising coloring book. “We are also honored to be working with an artist of Mr. Koons’ caliber, helping to expose his works to Chicago’s youth,” Salgardo continued. “We hope that this is only the first of many collaborations with this incredible artist."